If you buy an iPhone 4S off-contract from Apple, the phone comes unlocked. This means the iPhone can be used on any compatible GSM carrier as long as you have that networks micro-SIM card, and the device is activated on that network. 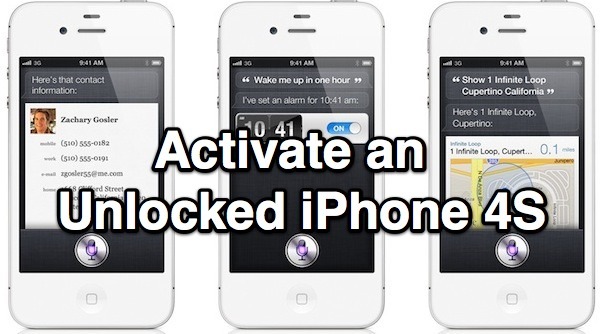 This guide will show you how to activate the iPhone 4S for use on other networks. Important: If you don’t own an iPhone 4S yet but you plan on buying an unlocked iPhone 4S in the USA, be sure to buy it directly from Apple and not from a carrier. Buying from a carrier locks it to that carrier even if you pay full price, while buying off-contract from Apple is unlocked from all carriers. This is the only guaranteed way to get an unlocked iPhone 4S in the USA. iTunes will show you a “Congratulations, your iPhone has been unlocked” message, indicating the device is carrier unlocked and can now use any compatible micro-SIM card. Thanks to Steve, Marcelo, and Antonio for confirming this solution with unlocked iPhone 4S models in the USA, Brazil, and Switzerland with a variety of carriers. The process is the same for all iPhones that come factory unlocked right? Yes, these instructions are for an iPhone that comes factory unlocked. I don’t understand why you have to go through that process to activate the iPhone4s in the US. I am in Qatar, and my carrier is Qtel and Vodafone. I got my unlocked GSM iPhone4s from the US apple.com and all I had to do was insert my Micro sim card turn on the phone and thats it, the phone was activated and it knew my location. it was a very simple process. obviously you are too dumb to understand the even dumber idiosyncrasy of u.s. carriers’ protectionism business strategy. Hi recently i bought iphone4s(locked) from US which is Version 5.0.1(0A406) Modem Firmware is 1.0.14. What they send me just only Phone(AT&T)SIM. I can not activate and unlock either,when i launch to itune it needs original SIM. So how can I activate and unlock this phone ? You bought a locked phone, that means it’s locked. Only phones bought unlocked are unlocked, but you can call Verizon after 90 days and have them unlock the SIM Card slot on the Verizon iPhone 4S. You could try calling them now and seeing if it can be unlocked before that, but it all depends on Verizon since that is the carrier. Well I just purchased an unlocked iphone 4S directly from the Apple store and I have not gotten this message. I am starting to worry whether my iphone 4S is locked or unlocked. I know that the only way to test it out is using t-mobile, but there is no t-mobile in my area, but I do travel overseas frequently, hence why I purchased an unlocked iphone. Is there any other way to confirm that my iphone 4S is unlocked? My model number is MD244LL. Thanks. I bought an UNLOCKED i-phone 4s DIRECTLY from the apple store but, I have problems with getting MMS to work. I took it to the carrier and they told me this phone is LOCKED since the “Cellular Data Network” Tab is missing. How can I tell if my phone is actually unlocked? Apple customer service won’t tell, I talked to them several times and they say the carrier is supposed to configure the APN network. If the iPhone is making and receiving calls on another network, it is unlocked. The MMS issue sometimes has to be resolved manually through APN settings, they vary from carrier to carrier, and some are automatically set. Bad news for those who purchased an unlocked IPhone4s from Apple and want to use data on Straight Talk. It will never work. Straight talk uses Verizon’s data network which is incompatible with your unlocked IPhone4s which uses AT&T’s GSM network. The techs at Straight Talks are idiots. They speak of the need to “jailbreak” your Iphone4 (and they don’t know about the 4s!). This would only work if you have a Verizon supplied IPhone4s. So with Straight Talk you can use voice and make calls, but that’s it! Surprisingly they don’t know this themselves and will sell you a data package which you cannot utilize. The only solution I am aware of is to buy a pre-paid sim card from AT&T (or another carrier that uses AT&T as its GSM network). I’ve used the 3G, 3GS, 4, 4S and 5 on straight talk. The 4S was the first one that didnt need to be jail broken for MMS. They all can use data, text and voice without jailbreak. To get data you go to (in phone browser while on wifi) unlockit.nz.co and install the right profile. The 4S can access apn setting by doing a SIM card trick. You need an activated straight talk sim and a verizon sim (yes, there is a such thing, that’s what I used) or maybe a tmobile or other sim. While there pop out the sim and put in the other sim, close the no sim message. Wait intently watching for the cellular tab to be selectable, quickly select, scroll down quickly and quickly select cellular data network, then pop out other sim and quickly put in straight talk sim. PS, befor starting this you want to get the att.mvno settings. I just got an iphone 4s and I have no idea if its locked or unlocked. I bought it on Ebay here in Spain and the seller told me that I can use it for any sim card. So I just cut mah normal sim to make it smaller so that it can be fitted but wen its done, tried n it didnt work. So can somebody help me out please!. you need a gevey sim look on ebay for gevey sim. hi .. i hav a unlocked iPhone4s , bought in canada …. can i activate that in india , by d above mentioned process ??? please help me …. You need to call Apple if they told you they would unlock it, nobody else can do it for you. Hi ,My Cousin sent me an iphone 4s from england network 3 . now he said that he have requested to Unlock Iphone Through IMEI . The managment said ok we will unlock in 48 hours and we’ill send u a confirmtn msg but they didnt . then he called them again and they said we want 48 more hours and even after that no msg was sent to my cousin . i m living in oman(middle east) . now i want to know that the iphone will be unlocked when i will insert sim and do the activation step and then they will send that msg for what im waiting or i should wait for the msg then iphone will b unlocked ? ? Same answer as an hour ago: You need to call Apple if they told you they would unlock it, nobody else can do it for you. I’m going to buy an unlocked iphone in the next month and I have a question. I live outside the US and I want the iphone to work on carrier in my country, but I will stay a few weeks in the US after buying the iphone. If I buy it with no contract from the Apple Store and then activate it with a prepaid plan from any US carrier, will it still be unlocked to use in my country? 2. will gevey sim card allow verizon to be my carrier? how many day do i have to wait to get e-mail from apple store to unlocked my i phone 4s ? i bought a unlock iphone 4, but can’t activate after restore . can you tell me why and why . Ok for those who say you need an unlocked iphone for straight talk let me clear things out. 1) straight talk uses both AT&T AND VERIZON towers. So that’s GSM AND CDMA, you can use an AT&T iphone 3, 3G, 3GS, 4, 4S and I’m sure the 5 will work. 3) I’ve done it on various iPhones so I know it works, you can use data aka Internet and sends MMS aka pics. Don’t tell me I doesn’t work. i have iphone 4 and these instructions worked perfectly!!!!! I have a iphone 4s and i am using the Jevey sim to unlock now how do i connect to the internet with another carrier? I recently bought an i phone 4 s from ebay.in on line..over the days i found out that my phone needs to be activated almost every time especially when theres is signal lost. pleas help me fix my phone at the earliest. Hello there, pls I have this same problem on my Iphone 5c, and its saying sim not active. Pls help me out. The previous carrier is Fido/Rogers Canada. Thanks. Pls I need guides on how to activate my Iphone 5c. Because it normal shows me a Halo text, wen I swipe it it says select language, and then it says select country, and then select either wifi or cellular to activate Ipho. I select anyone, but when it loads… It will later say, Sim not Active. Pls what can I do, Because I really want to activate it to show its menu and Apps. Thanks. Put in a working SIM Card, it needs a compatible SIM card to activate the iPhone. Kha, if you cannot activate your iPhone 4s that means your phone is locked. In that case, you need to send an unlock request via UnlockAgents if you know what network it is locked to. Hi…i got a iphone 4 from korea and it is not activated…i think so..when i on it says sim not supported..please help me..